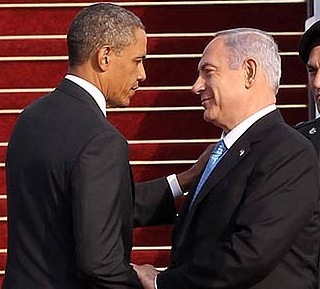 It looks as though Bibi Netanyahu did what Obama couldn’t…enforce a “red-line in the sand regarding Syria. Twice over the weekend the Israeli Air Force struck inside Syria. The first destroying a convoy of Iranian weapons headed for the terrorist group Hezbollah in Lebanon and then destroying a chemical weapons facility near Bagdad. An unnamed American official also reportedly said that a more limited strike early Friday at Damascus International Airport was also meant to destroy weapons being sent from Iran to Hizbullah. Analysts said that Hizbullah, which is under direct Iranian control, might attack Israel in retaliation, possibly drawing Lebanon into the conflict. However, they noted, both Hizbullah and Syria’s Assad are currently “overstretched” as they fight Syrian rebel forces. Israel has deployed two Iron Dome missile-defense batteries to protect its northern zone and the IDF has forbidden internal passenger flights to and from Haifa. Yesterday President Obama told reporters that Israel has every right to prevent arms reaching the terrorists. One would imagine he was secretly cheering the IAF along. It was only a few weeks before the American President drew a red line in the sand regarding the use of chemical weapons in the Syrian “Civil” War. Now that it has been proven chemical weapons have been used, the Administration has been acting like a deer paralyzed by the headlights of an oncoming car. The Israeli response of bombing the chemical weapons plant may take some of the pressure off Obama. Unlike the Administration’s consideration of arming the rebel forces who are linked to al-Qaeda, the Israeli response sends a clear message….We are not going to take sides, we are just going to make sure the chaos in Syria doesn’t spill over and harm our citizens. chemical and conventional weapons and making sure cannot be used against Israelis. With their actions this weekend, Israel has proven it says what it means…something Obama could learn from.